Richard's vision is blurred for a moment before it clears, and he sighs with relief, believing he is home. But when he takes a good look at his surroundings, he realizes he isn't back in his home world but instead in a strange barren landscape scarred with cracks and acid pools. Yet despite the alien look of the place, it feels familiar. Suddenly it dawns on him: it was the Ancestral City, only in the future! He then notices he is still wearing the armor Ronek had given him, and he still had his sword, though not his helmet. He then discovers he still has Golan's amulet, which he thought he had returned. Recalling the last words of the final prophecy, Richard begrudgingly starts to look for a way out of his current surroundings, making his way through the ruins of the once pround Ancestral City. He reaches the city gates and finds nothing by a desolate world standing before him. Just as Richard begins longing for the old Ancestral Trail, he notices a figure approaching him in the distance on the plain. He sees that it's Broon, leader of the Common Beasts and feels elated. 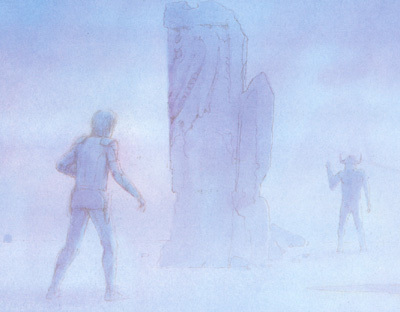 He rushes towards his old friend, hoping Broon can explain what was going on. Suddenly, before Richard could reach him, a shot of raw energy envelopes Broon and sends him into painful spasms. 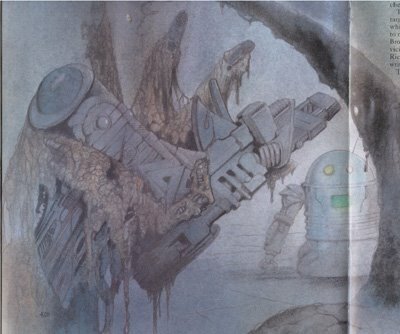 Horrified, Richards turns to the source of the energy wave and amazingly sees a small robot standing beside the Common Beast leader, the beam protruding from one of the robot's eyes. The mechanical being fires another shot at Broon, who howls in agony. Then something incredible occurs: Broon's skin peels away, revealing a metallic body with metal and wires. The robotic Broon writhes for a few more moments before its body snaps apart and collapses to the ground. The robot that killed Broon turns its attention to Richard, who is understandably nervous. Strangely, the robot doesn't attack but instead introduces itself to him as Robo, who somehow recognizes that Richard is the Chosen One. Robo insists that carbon lifeforms like Richard cannot survive in this world and will require his help. When Richard snaps that Robo had killed his friend, Robo disagrees and says Broon was going to kill him. Richard takes another look at Broon's broken body and for the first time notices something in the right hand: a futuristic gun, obviously meant for Richard. Having Robo's trust now, Richard listens as the robot explains that this world is known as the Cyber Dimension, which is an alternate reality of the Ancestral World. Richard shows Robo Golan's amulet, and Robo calculates that because the amulet hadn't been returned before Richard had been transported home, he had been incorrectly sent to the Cyber Dimension. When Richard inquires how to get back home, Robo says the only way is to return the amulet to the Evil One. Richard is rather surprised the Evil One is still alive, but all the same asks how he can return the amulet to him. Robo's peculiar response is to ask Richard to check the robot's chest panel. Richard does so and finds a series of numbers flashing on it. Recognizing it as binary, he translates it as best he can, though he is confused by the meaning of the message. Suddenly, before he can ponder it, Robo and Richard hear a loud whirling sound behind them before being swept off their feet by some unseen force and into the air. Robo issues a warning that a metallic being called Tengam is pulling them up and requires evasive action. 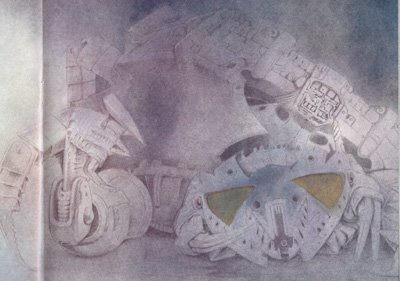 Richard looks up to see the robot, which is pulling them upward with a magnetic field towards a hollow beneath Tengam's body, where metallic blades swirled viciously. Robo's evaluation about Tengam using magnetic fields to attract metal for regeneration doesn't help them, but what does help them is when Richard notices a glowing orb behind Tengam's grinder. 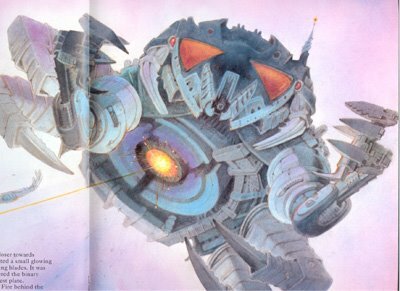 Recognizing it as the creature's power source, Richard orders Robo to strike the central core. 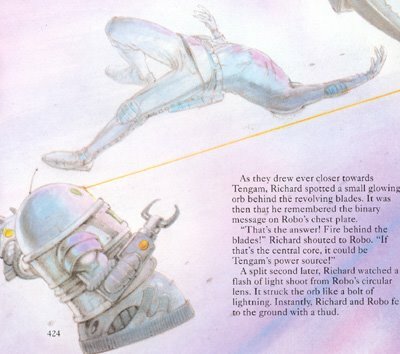 Robo releases a familiar shot from his circular lens and strikes the core; instantly both he and Richard fall back to the ground. 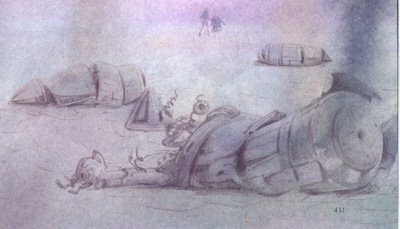 Richard quickly gets up and sees the lifeless form of Tengam laying beside him. Robo, however, advises that Tengam will regain conscience eventually and that they should leave the area. With Robo leading the way, the two head away from the gravity defier. Richard finds himself amazed at the expansive landscape they find themselves in, with the ground made of countless slates wielded together and sounding hollow with each foostep. His distraction is such that he doesn't notice Robo is gone before it's too late. Now alone, Richard decides it best to press on, though he finds himself wondering just who Robo is and what his agenda is. Just then, he notices a dark line approaching him from the distant horizon. He tried thinking about what to do, but the line moved too quickly for him to make any sudden decisions. He quickly discovered the line was composed of bullet-shaped robots soaring over the air, and without warning they surrounded him from all sides. 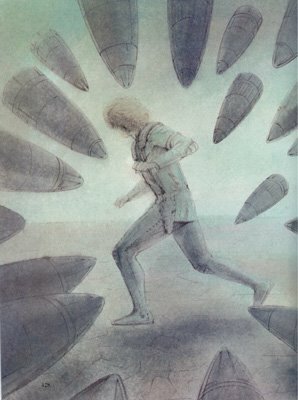 Richard unsheathes his sword, but the bullets respond by slowing closing in, threatening to crush the Chosen One. Before they could touch him, a bright light flashes and leaves several of the robots lying on the floor in pieces. The remaining bullet-like creatures reform into a line and dash off, as if nothing had happened. To Richard's relief, Robo had returned. Robo identifies the bullet-like robots as Land Leapers and advises avoiding them. As the two of them resume their journey, Richard tries asking several times why Robo deserted him, but the robot doesn't respond to the question. Resigned to his companion's silence, Richard continues following Robo, the landscaping changing into a place where foul-smelling liquid pools dot the area. Soon the landscape changed again, this time with a metallic flooring with square holes in patterned positions. The two of them walk along this new ground in silence before their travels are interrupted. 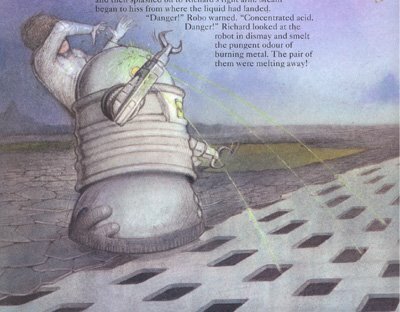 Green liquid suddenly shoots from several of the holes in the floor, striking Robo and bouncing onto Richard's arm. Robo immediately warns that the liquid is concentrated acid, and Richard watches in horror as his arm hisses with the sound of burning metal. And so the second half of The Ancestral Trail begins with the twenty-seventh issue, taking our hero from a fantasy world into a science-fiction setting. So now we go from giant monsters and magical beings to creatures based more on scientific principles. Okay, so there won't be any grounding of reality, but as long as things remain fun, that shouldn't be a problem, eh? The Cyber Dimension series starts off by addressing a plot hole not dealt with in the last issue...okay, maybe not dealt with, but more like mentioned. In the previous issue, the Evil One had been destroyed and the Ancestral World saved thanks to the victory of the good side in the Final Battle. But what's this, the Evil One isn't really destroyed, says this issue. Now, those who've read the previous issue recognize the plot hole: the Evil One was never even seen in the final issue (unless you count a brief glimpse of his mask in smoke at the very end). It's never addressed how the Evil one was killed in the Final Battle. 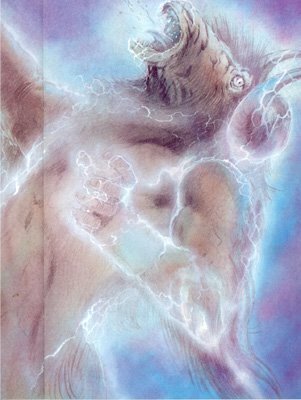 One could make the case that the forces of good didn't believe they had killed the Evil One but believed they had rid the Ancestral World of his influence, but if that's the case, then why did Richard believe the Evil One to be destroyed? One thing that made me blink the first time reading this issue was that when informed that the only way to return home was to return Golan's amulet to the Evil One, Richard doesn't hesitate to ask where the Evil One is. He doesn't want to kill the Evil One, mind you, but instead wants to return the amulet to him. Had The Ancestral Trail been given more space to allow for more complex characterization, I would've loved to see this area of Richard's personality explored. After going through hell to save the Ancestral World, all he wants to do is return home. How would you feel to find yourself in another crazy world and the only way back is to return someone important to someone evil? Would Richard really do such a thing despite, or perhaps because of all he had been through? 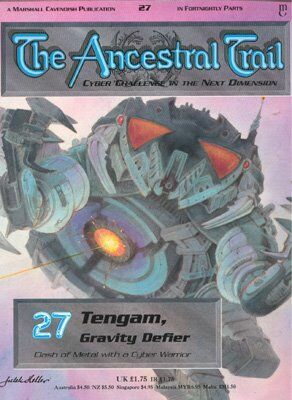 Finally, I'd like to mention this issue's villain, the gravity defier Tengam. Tengam is obviously not a really big villain here, as he isn't even seen in half the issue. In fact, I doubt he's even evil - he tried to kill Richard not because he's an enemy of the Evil One, but because Richard wears armor that can fuel Tengam's core. One wonders who will be the first creature in the Cyber Dimension that has a more direct connection to the Evil One.